A cheerful toddler bedding will encourage sweet dreams. Is your little baby heading out of his crib already? Wasn’t it just yesterday that he was gurgling and burping between toothless smiles? Yup, time flew by while you were busy changing diapers and squinting at feeding schedules. While some children simply breeze out of cribs and snuggle into their toddler beds without much ado, yours might be the one to fuss and fume at the change. Some kids find it hard to transition from crib to the big little boy bed. Enticing him with his favorite theme or color of bedding set might be just the nudge he needs. 1. Bedtimes can be Fun Times. Toddlers are so active, just watching them can be exhausting for us adults. Rest and sleep are essential ingredients for their healthy growth and development. Yet, we often have to struggle to get them to lie still in bed. 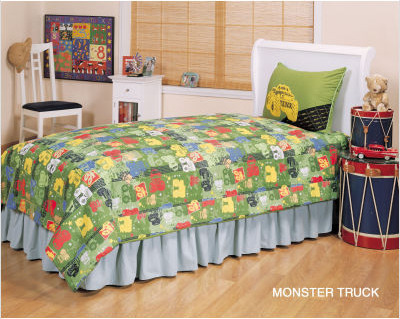 A kid bedding in colors or themes that appeal to your child will at least get him into bed. Whew, that takes care of the first part! 2. Playful and Cheerful? Can that Encourage Rest and Sleep? Baby nurseries have soothing pastel colors that lull the baby to sleep. Kids rooms, however, often boast bright and cheerful colors. With oranges, yellows, neon greens and more, you might wonder if the toddler bedding can truly help your child sleep well. It can! Simply by creating a room that your child loves to be in. Also, a cheerful room will keep his spirits high, so his sleep will be restful. 3. Aren’t Themed Childrens Bedding a Waste of Money? Have you gone shopping for little girls or boys bedding? Whether you search in your local store, high end kids’ stores or any quality online stores, you just cannot avoid the flood of cartoon characters just waiting to pounce on your super-excited child and your unsuspecting wallet. Your dilemma now is…do you indulge your kid or listen to your wallet. We have two suggestions for you: Point 4 and Point 5. Check them out. 4. Research Your Way through the Maze. Wading through the selections of toddler bedding sets can be exhilarating yet exhausting. First select all (yes, we did say ‘all’) the themes and colors that your child likes (or will like, if you are shopping alone). If you have already decided on a theme, the decision is easier…you still have a couple of things to check though. Also, keep an eye out for store flyers and sale notices in your mail-box. Since most stores keep similar items in children bedding, buying during their sale weekend or with special discount vouchers, can really help your wallet. 5. Talk to your child. Yes, we have mentioned this before. A toddler can be quite set in his interests and likes…so what if it changes tomorrow. He will be just as adamant about his new favorite then. Yet, if you take him into confidence and explain things while he is calm, he can be surprisingly flexible. Asking your child his likes and dislikes does not imply acceptance of unjustified demands. It gives you the range within which to work. 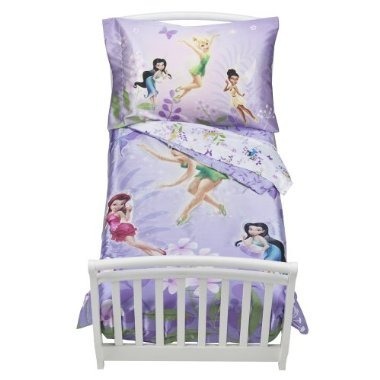 Do not approve buying a character based toddler bedding? Take your child into confidence and explain the virtues of whichever other kid bedding you have selected. If his heart is set on that character, look for wall décor and other room accessories through which you can add it in the room. 6. Get the Feel of the Fabric. Before using the childrens bedding or kids comforter, allow your child to feel the fabric. Since the sheet and comforter will be touching the skin, it is important that it feel soft and snuggly. An itchy, rough sheet will translate to sleeping problems for your kid. To better understand what’s best for your child, check out our pages on Kids Comforters and Kids Bedsheets. 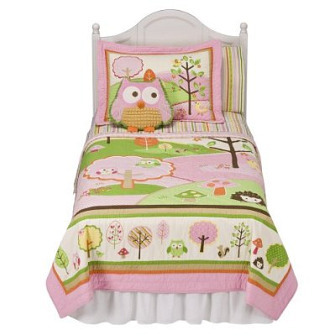 You will find a wide array of simply adorable toddler bedding for little girls. From pretty pinks and purples to fairies, princesses and ballerinas, to Dora, Tinkerbell and Barbie, to flowers, butterflies and cats…you will be hard pressed to bring down your purchase to just the one. 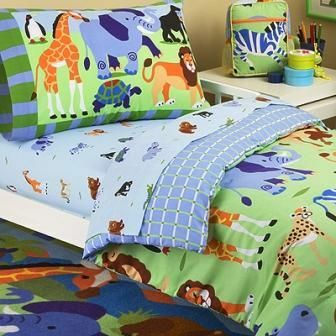 The kid bedding industry has completely changed the mindset of boring boys bedding and created just as diverse and playful bedding for little boys. From bold reds, blues and greens to transport, sports and pirates, to Transformer, Spongebob and Sesame Street, to outer space, dinosaurs and dogs…your little toddler can decorate his room in any theme he enjoys. Although at this age, most kids are particular about their preferences, parents might want to opt for gender neutral bedding (especially if brother and sister are sharing a room). Jungle animals, Farm animals, character themes such as Wubbzy or Backyardigans or color co-ordinated themes would be the way to go. 10. Bed in a Bag. One of the most popular items today is 'bed in a bag'. Buying a complete bagful of bedding eliminates the effort of finding matching comforter, sheets, sham and pillow covers. The combined price of buying the entire childrens bedding together is also much lower than going for individual pieces. Once you find the right balance between your child’s interests and your wallet’s recommendations, decorating your kid’s room will become a fun activity. The right toddler bedding can help you set the tone for the rest of the room.